Agensi Pekerjaan Jobsbac Sdn Bhd (a wholly owned subsidiary of BAC Education Group) in collaboration with the Ministry of Human Resources Malaysia (MOHR) launched www.specialjobs.com.my, a job portal that focus on connecting employers with jobseekers that are living with disabilities in Malaysia. This momentous occasion was held on Tuesday, 23rd October 2018 at BAC’s PJ Campus. The guest of honour YB M. Kulasegaran, Minister of Human Resources, Malaysia, officially launched the event. Also present at the launch was Senator Bathmavathi Krishnan, special needs advocate of Dewan Negara Malaysia. The launch was attended by over 100 guests from government agencies, corporations, academia, multilateral agencies and non-profit organisations within the Klang Valley. 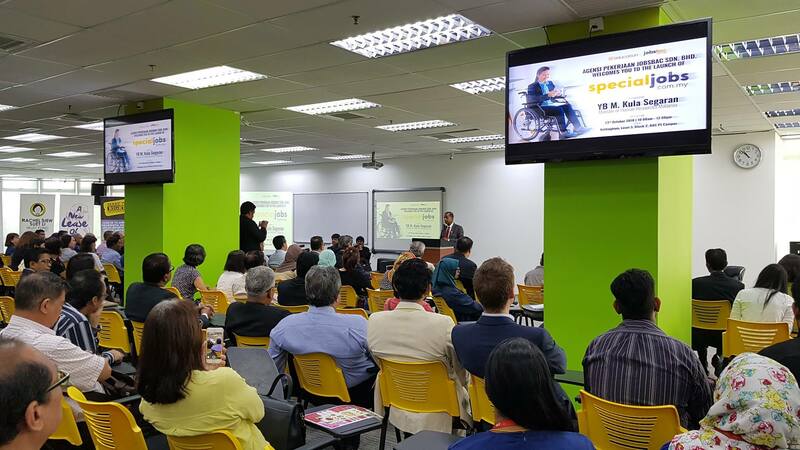 During the keynote address, both YB Kulasegaran and Mr Raja Singham, Founder of Jobsbac and Managing Director of BAC Education Group highlighted some of the benefits to employers hiring PWDs, for example, double deduction of the remuneration paid to PWD employees in computing the adjusted income of the employer and employers will be reimbursed for the cost incurred to renovate a workspace or purchasing special equipment for PWD employees. Employers can also expect a lower turnover rate and increased productivity in employees who are PWDs. Specialjobs.com.my was incepted with the aim to connect employers to jobseekers living with disabilities by securing the right talent at no cost as well as promoting inclusive employment in Malaysia in line with the objectives of the Government.